In near mint condition, a superb Edwardian 11th (Prince Albert's Own) Hussars, original owner Frederick Vanderstegen Drake, MC and Croix de Guerre avec Palme. 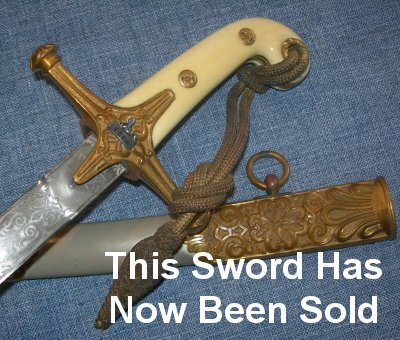 This is about as good as it gets regarding 20th Century cavalry swords. 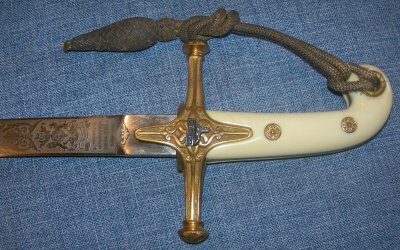 A WW1 hero, his sword bought in 1908 (serial number 41763) from Wilkinson's, in near mint condition (leather carry case is not illustrated but is included). Bought from his grandson. This mameluke is both rare and in exceptional condition. I suspect it has been kept in a very dry place (probably next to a chimney stack in an attic) for a very long time. I say this because the leather carry case (not photographed but included) was as dry as a bone with some soot / cinder marks to it. I did not want to show the carry case on the page as the carry case is very aged and really only for posterity or to give to a leather worker to make a new one. I preserved it with leather balsam to keep what there is. This poor leather carry case however, is the reason this mameluke is still in such stunning condition. The 32 inch blade with battle honours including Waterloo and four Crimean battles, 11th Hussars crest, Egypt with Sphinx, Edward VII's royal cypher and Frederick Vanderstegen Drake's initials is in near mint condition, a few scratches and tiny rust spots, but nothing much. Firm in the hilt; the ivory grip pieces and rosettes in perfect order, the crossguard with the Egyptian sphinx again. Sheathes and draws as new into the enameled and gilt worked metal scabbard; some wear to the gilt, some staining to the enamel, but exceptionally good overall. Complete with original sword know. A stunning "eat your heart out" sabre to a named and very important officer. Further / full sized pictures available upon request. The item reference number is A81 (463).